This professional Latin American group was formed by the perfect combination of talent, experience, and creativity. The Directors of the group Victor and Shiraz Valdes, who have been performing around the world for 15 years, have been together since September 1997. They have created a fabulous unique show filled with tradition, choreography, colour and wonderful sounds. From the beautiful soft sounds of the harp, to the explosive rhythm of the rumba, this spectacular presentation has a great variety of numbers. Victor Valdes is a professional musician, singer and dancer. As a solo harpist he has given concerts from San Diego to New York, from Paris, France to Caracas, Venezuela. For three years in a row he won 1st place in the National Folklore Dance Competition in Mexico City. Here, he is currently a dance teacher at the Sydney Dance Company. Shiraz Valdes is a professional dancer who began training at the age of 5 in classical ballet, tap and jazz. She graduated from BAL (Ballet Australasia LTD) completing elementary grades. 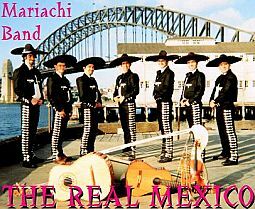 Shiraz has been specialising in Latin American rhythms since 1995. In 1997 she graduated from a teachers course at the Industrial School of Dance in Xalapa, Veracruz, Mexico.